Have you ever wanted the ability to control your PC from another room but couldn’t find an easy way to control it? Well, the folks over at Zanware have found a solution! 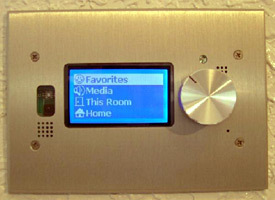 The Zanware PC Controller has a 128×64 pixel graphical LCD, IR receiver for remote control, and control knob for menu navigation. In addition to that, each unit has a temperature sensor, light sensor, status LED, and buzzer. The controller is powered via the Ethernet cable that allows for a simple single wire installation. Each unit comes with a stainless steel or gold faceplate, and can be installed in either an “old work” or “new work” standard 3-gang UL electrical box. This little controller will set you back $330… which isn’t that bad if you think about how extendable it is.